An Email when this Salmonella Infection in Pigs / Swine / Pork page is Updated? The most comprehensive reference manual available on veterinary antimicrobial medication of farm animals has been thoroughly revised and updated to reflect the rapid advancements in the field of antibacterial therapy. Encompassing all aspects of antibiotic drug use in animals, the book provides detailed coverage of virtually all types of antimicrobials relevant to animal health. Antimicrobial Therapy in Veterinary Medicine offers a wealth of invaluable information for appropriately prescribing antimicrobial therapies and shaping public policy. Divided into four sections covering general principles of antimicrobial therapy, classes of antimicrobial agents, special considerations, and antimicrobial drug use in multiple animal species, the text is enhanced by tables, diagrams, and photos. Antimicrobial Therapy in Veterinary Medicine is an essential resource textbook for veterinary practices, animal health & pharmaceutical companies, veterinary & agriculture students, farmers concerned with the economic and effective use of antimicrobial drugs, veterinary practitioners, public health veterinarians, industry & medical research scientists. QUESTION: IS IT SAFE TO SPREAD INFECTED PIG MANURE ONTO PASTURE GRAZED BY CATTLE? Salmonellosis is a disease affecting most livestock production systems worldwide and resulting in much human illness from poor hygienic procedures. 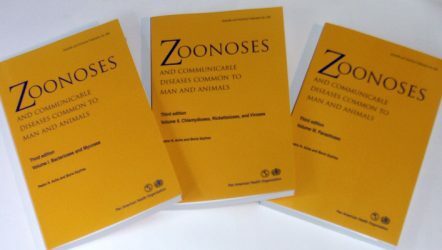 As a zoonosis the disease has assumed increasing importance in recent years. It is a major cause of human food poisoning outbreaks. Food safety programmes therefore pay much attention to Salmonella monitoring and practical hygiene control including sterilisation and disinfection of equipment, materials and surfaces that might become a source of contamination of food - especially meat - by Salmonella bacteria. Salmonella infections in swine spread very quickly following oral exposure. Organisms multiply rapidly in the intestine, before spreading to many internal organs, resulting in an overall reduction in pig performance. Infected hog manure / slurry is therefore a matter for concern in the spread of Salmonellae as well as live pigs and fresh pigmeat (pork) and cured pig meats (bacon, ham) and manufacturing products: sausages, pork pies. Salmonella typhimurium also has a greater potential to develop multiple drug resistance and the presence of such isolates has increased dramatically over the years, posing a serious health risk for both pigs and humans. Salmonella typhimurium is the most common salmonella serotype isolated from many European pig herds. Infection is usually sub-clinical and many animals go on to become carriers resulting in a potentially serious problem during processing at the abattoir. UK - Europe Canada U.S.A.